Each and every year in the United States, over 1 billion dollars of commercial equipment is stolen… with more than 90% of this equipment never recovered. The results of this epidemic are far reaching, as companies waste countless hours of lost productivity, wasted management time, and are forced to pay extremely high and growing insurance premiums. The Solution: HeistProof, KIM and HeistProof Plus. HeistProof is an anti theft device for any vehicle. HeistProof shuts down a vehicle’s operating system except to those it recognizes as authorized to operate the equipment. KIM – Knowledge is Money – Using real time GPS (Global Positioning System) technology, KIM provides fleet management capabilities such as, where is your equipment, who is driving your equipment, is your equipment exceeding the speed limit, where has your equipment been, has your equipment moved beyond its designated area and many other features. HeistProof Plus incorporates all HeistProof’s anti-theft technology and KIM’s fleet management systems capabilities for a complete package of protection for your vehicles and equipment. Every dollar currently spent in the industry for theft prevention is “Post theft” dollars. 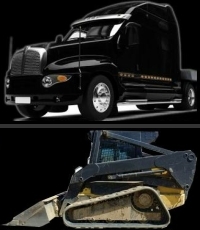 Stolen equipment locator devices, and insurance address equipment theft and joy riding damage after the loss. HeistProof, KIM and HeistProof Plus is the 21st century answer to this problem. HeistProof is “Preventive Theft Technology”, an idea and system whose time has come.